Looking for the most basic, quick, freshly made and good value pizza in London? Stop looking, because I've found the perfect place for you. 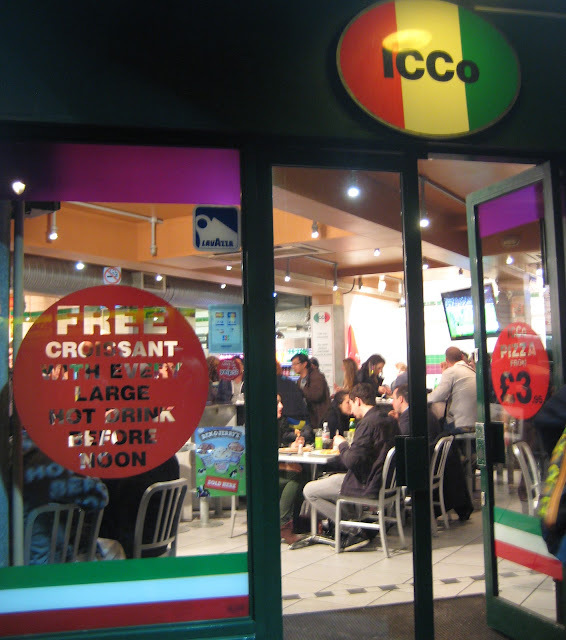 At ICCo (Italian Coffee Co.), you can find pizzas to take away and eat in, made fresh right in front of you. I don't think you can find any cheaper, freshly made pizzas in London! I've been here twice and even though I must admit it's not the best pizza I've ever tried, it's still a pretty good basic pizza. The dough is definitely not as greasy as at the main pizza chains in London which makes it a wee bit less unhealthy, but also a little bit dry. I've opted for the pepperoni pizza twice (which is my favorite) and it's really hot and tasty. There is spicy oil, garlic oil, spicy chili flakes, oregano, salt and pepper so you can make it to your own taste. There is also a selection of two salads as a healthy option, and a long list of fresh smoothies which I'm dying to try out. Definitely not a fancy restaurant. It has quite an authentic feel to it, the staff is friendly (mostly Italian) and it's always busy. Bright TL lights, stainless steel tables and chairs don't give this restaurant a cosy atmosphere but that doesn't really matter. It's also purely self service, so you order at the till, pay and you receive a buzzer that will let you know when the pizza is ready. It's the perfect place to have a very casual dinner with friends. From £ 3.50 and to eat in from £3.95 for a margarita. A pepperoni pizza costs £5. Extra toppings cost around one pound I think. Want to have a quick lunch/dinner and you're yearning for a fresh hot pizza? This is the place to go. I will be going back here, simply because it offers great value for money and it's something different than all the posh, overpriced London restaurants.